It’s official–the coconut crab has the strongest grip of any animal. Researchers at the Okinawa Churashima Foundation in Japan, found that a coconut crab’s pinching power corresponds with its size — and that force was tremendous. Scientists collected 29 coconut crabs and then had them clamp down on a bite-force measuring device. The largest crab in the bunch weighed 4.67 pounds and squeezed with the force of 1,765 Newtons. By comparison, a 143-pound human with proportional strength of this coconut crab could grip with a force of 6 tons. Coconut crabs, which are native to islands in the Pacific and Indian oceans, use their claws to gain a dietary advantage. They can crack open coconuts — hence their nickname — but also other crabs, fruits, nuts and a wide variety of other foods that they can get their claws on. Even one of the researchers, marine biologist Shin-ichiro Oka, was pinched on his palm twice. While the crab didn’t break any bones, Oka’s hand was essentially paralyzed until the animal released him. “While it was only a few minutes, I felt eternal hell,” said Oka, whose team published their findings Nov. 23 in PLOS One. The upper limit of this fierce pinch is potentially bone crunching. The heaviest recorded weight of a coconut crab is 4 kilograms. By extrapolating their measurements, the scientists proposed that this crab might be able to pinch with the force of 3,300 Newtons. That’s stronger than the bite of any land animal except alligators. 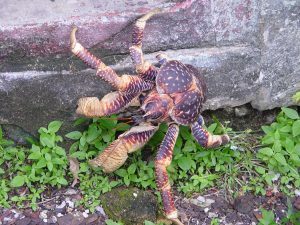 People in South Asian and Pacific Island nations regard the coconut crab as a delicacy, and as a result, its population has been threatened or made locally extinct by human activity. Left: A coconut crab walks on the Chagos Archipelago.Photo by Anne Sheppard.